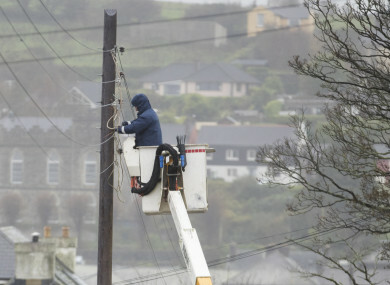 ESB crews restore power in Kinsale, Co Cork, after Hurricane Ophelia hit in October last year. THE GOVERNMENT HAS made over €7 million available to local authorities to cover the costs of repairing the damage done by Storm Ophelia. The ex-hurricane hit the country in mid October, causing serious damage to homes, businesses, and roads, and resulting in the deaths of three people. The tropical storm did the worst damage to the south-west of the country, where it first landed. Of the €7 million being allocated to local authorities, over €3 million has been given to Cork City Council (€1,986,474) and Cork County Council (€1,492,829) collectively which gives an idea of the scale of the damage done in that region. The unprecedented weather event left 385,000 businesses and households without power and 109,000 people without water at the peak of the storm. Gardaí, fire services and other emergency teams, as well as representatives of local authorities, Irish Water and the ESB worked to restore services and repair the damage in the aftermath of Storm Ophelia. The Department of Housing, Planning and Local Government said that the funds were being made available as an acknowledgement of the “exceptional nature of the preparation and response activities carried out by the local authorities” and that “the costs of these activities could not be met from existing resources”. Minister for Housing, Planning and Local Government Eoghan Murphy also announced this afternoon that he is to speak with Minister for Finance Paschal Donohoe about setting up a ‘contingency fund for severe weather events’ as the instances of “high profile severe weather” are increasing. The amount of money spent on repairing damage done by these severe weather events have also increased. In the winter of 2013/2014 over €9 million was spent on cleaning-up after storms, while in the winter of 2015/2016 over €17.721 was spent. Orange wind warnings and yellow rain warnings have been issued again today for most of the country as Storm Eleanor is due to hit today at around 4pm. Email “Over €7 million paid out to cover cost of Storm Ophelia damage”. Feedback on “Over €7 million paid out to cover cost of Storm Ophelia damage”.